Thanks to all the local symposium attendees for sharing what was going on. I vicariously got to experience the symposium through you all. It sounded wonderful and I wish I could have attended. I look forward to more posting of your sketches from your time there. While you were at the symposium on Thursday, I went to the Japanese Tea Garden with some UW students to sketch for the afternoon. It was really a challenge to change from buildings to trees. I had one unsuccessful drawing in the park but was able to get a decent sketch at the entry and a sketch of the waterlilies and carp that I was happy with. So here it is. Look forward to our next meeting. "Decent"? "DECENT"??? I'd say you left decent in the dust miles ago, Gail. 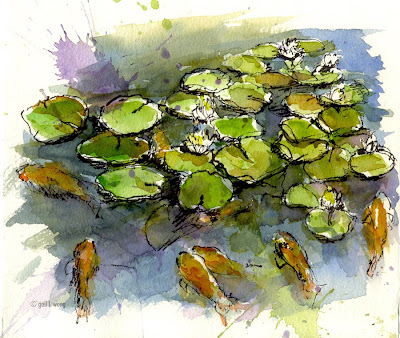 Amazing how that splash of purple helps make the pond one, though of course the drawing itself is wicked cool. But you should have seen the one I didn't put up. That is the one that didn't work. I was trying Tia's splash technique. It worked well for the waterlilies. Gail, I agree with Susan! Stunning, rapturous work! !